Orlando, FL. – Rob and I attended the ACIM conference held in November of 2018. Several of the medical and behavioral professionals including radio, tv and health webinar celebrities were well received by the attendees. Some of their practical recommendations for better cognitive health are summarized below. In my opinion, Dr. Norm Shealy MD was the most spiritual and encouraging for those suffering from the trauma of opioid addiction. His head device that he calls the “halo” or Chakra-sweep PEMF (Pulse Electro-Magnetic Field). Since life has adapted to the low frequencies of Earth, this device slowly raises the frequency to that of the gamma level which is key to our optimum creativity and happiness. Dr. Norm in reviewing clinical data, expressed a strong opinion that gamma and neurotransmitters can alleviate pain and opioid cravings and improve upon social behavior in the brain that contributes to improved success for patients recovering from their opioid additions. Dr. 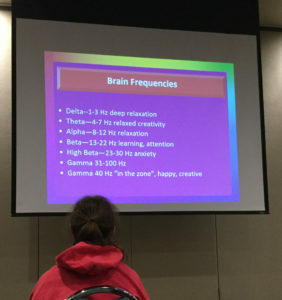 Norm and his partner, Sergey Sorin MD, showed this slide above relating to the range of brain frequencies. Delta relates to sleep or meditative rest (1-3 Hz). (Note: Dr. Norm said the “Bemer” devices typically have a frequency that matches that of sleep which he said that is good too). While awake and attentive to learning, our brain frequency rises to Beta (13-22 Hz). There seems to be a “sweet spot” for anxiety or High Beta (between 23-30 Hz). Gamma or “in the zone” of creativity and wellbeing is between 31 and 100 Hz. Dr. Norm’s halo device frequency ranges between 5.83 and 56.83 Hz, starting with the lowest frequency and slowly increasing to “sweeping” the Chakras. During this presentation, I thought about my own “gamma” experience of writing informative articles for our customers. After his presentation, I waited some minutes to talk with Dr. Norm. He had a deep personal conversation with each person in line. When it was my turn to talk with Dr. Norm, I expressed my appreciation to him and his angels in discovering ways to alleviate chronic pain … including those incarcerated for crimes associated with their drug addiction behaviors. He held both of my hands and told me that he wanted to be a physician at age 4 (back in the 1940’s). Dr. Norm has been on a long medical journey, realizing early in his career that splicing nerves did not alleviate pain in the long term and could actually manifest into paralysis in some cases. Prescribing narcotics for pain relief also backfired. Just as he was open to sharing his spirit with me as well as others at the conference, later in his career searching for less invasive and effective pain relief alternatives, he outreached to acupuncturists, mystics and faith healers to learn their practices. He blended their knowledge with his medical background in developing electromagnetic devices. Dr. Norm is considered a pioneer in discovering more effective methods for chronic pain relief. It was indeed a “gamma” experience for me to meet him! Commercial multi-vitamin products can be like mineralized rocks that are sugar coated and only pass thru the body. Electronic mineral nutrition is needed for cellular bioavailability critical for supporting good brain health. Additionally, magnesium orotate is recommended. Steve Haltiwanger, MD. AquaNew’s Note: Drinking the Polarized Water while taking vitamin supplements will provide such an electronic transport. Mercury gas can have a residence time in the body, traveling to both the gut and brain, for approximately 32 years. Residual mercury from former dental amalgam fillings and environmental mercury can outgas into the brain even when answering the phone. During sleep, the brain cells shrink leaving space for toxins to invade the brain. Take chlorella (made by BioPure) before going to sleep and turn off the wi-fi in your house. Dietrich Klinghardt, MD (bio dentist). AquaNew’s Note: We have written testimonials from individuals, including one from a dentist, who reduced both the mercury and heavy metals levels in their bodies by drinking the Polarized Water. Limit amount of sugar, carbohydrates and alcohol consumption to starve myotoxins (fungi) that invade our bodies … don’t become their Uber. Use plant-based defense against fungi by adding cinnamon, grapes and oil of oregano to your diet. Myotoxins can invade the myelin sheath of neurons. There seems to be a correlation of toe fungus and patients who have cancer. Fungi do not survive in aerobic environments. Doug Kaufmann, Host of the Now the Cause Show. AquaNew’s Note: Either drinking the Polarized Water or breathing the Dioxytetrahydride Gas will create higher-energy aerobic environments inside the body. Thanks for this very interesting info!! this post reminds me of myy previous roommate! He continually kept preaching about this. Next post: Can Fungi (Mold), Bacteria and Viruses Effect Both Our Brains and DNA?